Adult male Montagu's (Circus pygargus). Truly gorgeous birds, despite the generally bad condition of the plumage by this time of year (or the typical Batumi overcast skies). Loose flocks of ringtails that often either pop up out of the valley, like these birds, or are high in or above the streams of Honey Buzzards. 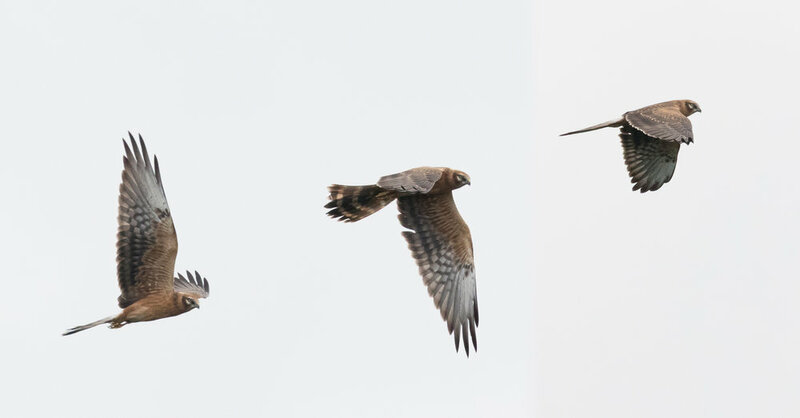 Adult male Montagu's (Circus pygargus) passing in between flocks of mainly Honey Buzzards. And the cracker: A dark morph adult male Marsh Harrier (Circus aeruginosus). Luckily I got to see 3 of these during my stay, but I'm still waiting for the moment one passes by close at eye level.